I was invited to the University Learning and Teaching Committee yesterday to give a short presentation on how learning technologies can be used to deliver feedback to students. This is an area in which students themselves (and their Union representatives) can see opportunities for much more use of technology. In my presentation I covered a range of tools, many of which are already being used effectively by academic colleagues here at Loughborough. The tools include Camtasia and ReVIEW (Echo 360) Personal Capture, which allow tutors to make screen recordings in which they use highlighting tools to pick out features of assignments, with an audio narrative added on top. Grademark, part of the same suite of tools as Turnitin, also allows you to make audio comments on submitted assignments, but with online marking functionality and the facility of creating your own custom text comment banks. 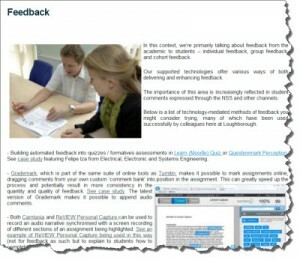 For more details on the full range of tools, and links to case studies, see the new Feedback page in the Tools for Teaching section of this blog. This entry was posted in Feedback, Online marking, Pedagogic by Charles Shields. Bookmark the permalink.